A stand-up comedian, a bass guitarist and a nice Jewish boy walk into a bar. His name is Zev Citron. Zev is a believer in the power of creative outlets, and seeks them out in any way he can. 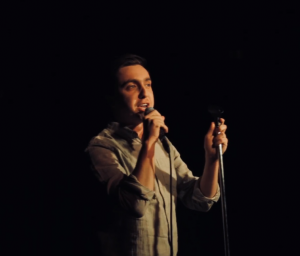 He has experience as a stand-up comedian and is now focusing on his passion for music. He talks about the differences between what it’s like delivering a bit and playing in a band. Zev appreciates his time onstage out of the spotlight, and has been practicing tirelessly, joining multiple music groups as a bass guitarist. Zev Citron is 23 years old and grew up in Thornhill. 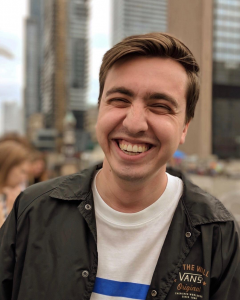 He graduated from Ryerson’s Creative Industries, where he joined the university’s comedy troupe and found he had a knack for it. After graduating, Zev began to focus seriously on his music and hopes to one day release an album and go on tour.